What a great day to plan a regatta! The West Jersey RC Laser Fleet holds its fall regatta the Saturday after Thanksgiving each year giving the sailors of the family a break from the traffic and the crowded malls. 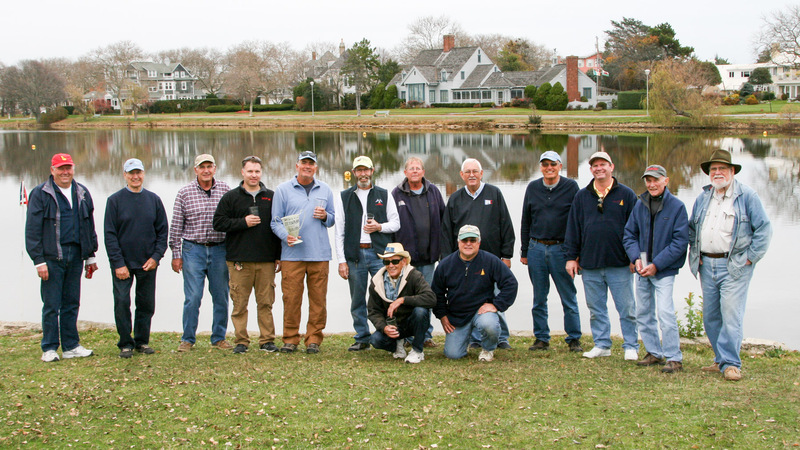 Riverton Yacht Club had pulled its floats early and the Cooper River is in the process of being dredged, so this year’s regatta was held at Spring Lake, NJ, where the Marbleheaders of Spring Lake call home. The Marbleheaders have started an RC Laser fleet and hosted their second RC Laser regatta of the year. The fleet of 13 was made up of skippers from NJ and PA. The winds were very light with A sails being used the entire day. This group was not going to let the light conditions spoil their fun for the day. A great time was had by all, including the large group of spectators the races drew. There were five different winners of races with the regatta winner, Dave Brawner winning 2. Other race winners were; Ryan Lippincott 4 wins, Nick Mortgu 1 win , Harry Mote 1 win, and Ray Sculczewski (Cape May Ray) won his first race sailing against A fleet sailors. Even in this medium size fleet there were four national champions to sail against. Dave Brawner in his typical regatta wins, won by one point over Ryan Lippincott. Thank you Jim Flach regatta Chariman and your team of Skip Hall, Andrew Herschmen and the Marbleheaders of Spring Lake for giving your time to put on an excellent fun regatta.